Gridiron magazine is a UK-based monthly digital magazine that takes its readers inside America’s game. We do this by bringing you exclusive interviews with players and coaches, sharing the thoughts and opinions from all of your favourite pundits and keeping you up-to-date with the latest news from the NFL, college football and Britain’s domestic American football scene. The magazine that covers every sport – not just football! – and delivers a mix of big-name sporting interviews, great previews of the forthcoming week’s action, as well as offbeat stories and lifestyle news. 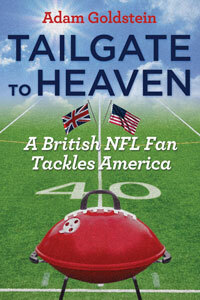 Adam “The Tailgate Knight” Goldstein, is the British author of “Tailgate To Heaven: A British NFL Fan Tackles America” This British NFL fan has travelled to see a home game at every NFL stadium in one regular season.